Are you tool focused and lacking analysis/optimization resources that can take the time to take action on your data? Or are you lacking governance, buy-in, agreed upon goals/KPIs/targets and possibly making decisions off inconsistent data? Perhaps you are already aware of these issues and you are going 100mph to make them happen. If you don’t already have honest buy-in from the top with documented governance, then you need to stop. It is likely that expectations aren’t clear, execution won’t be successful, or that you will get derailed by changes in personnel and business decisions. While we all want to EVOLVE our organizations to achieve personal and company goals, many leaders lack clarity on the current state of analytics in their organizations. For example, the perception might be that the maturity of analytics in the organization is high, but what is this based on? Gut? The difference between perception and reality is a gap that our Analytics Maturity Assessment will address. Don’t worry! Almost every organization of every size is currently struggling with the challenges associated with building their analytics team and becoming a data-driven organization. You need external validation of the issues you have, and a clear way to bring them to the attention of the powers that be throughout your organization. 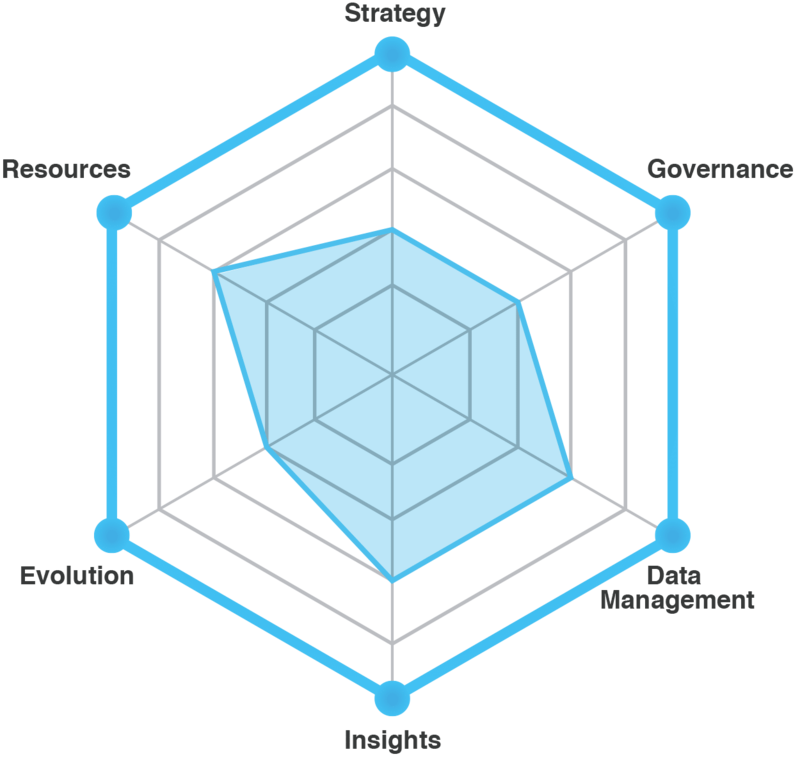 An analytics maturity assessment is the perfect way to do this; through both internal and external assessment. Beyond making your organization aware of where your analytics maturity stands, we will provide recommendations on how to prioritize your analytics efforts, increase structure and better ensure you are on your way to competing on analytics. As a leader in your organization, you need the clarity that is provided by a holistic analytics strategy and a clear roadmap. A strategic roadmap will help you achieve both your analytics and company goals. Those maturity levels and key process areas defines common features and attributes as well as key practices that will significantly increase the likelihood of success and positive return of an analytics program. This is a sample analytics maturity assessment visualization. Be aware that an organization needs to move systematically from level to level without getting too far ahead or behind in any given area. Assessment – We help you execute a quarterly survey of team members across your organization and then combine this input with our external experience. This data is scored to help you more optimally understand your current state of analytics and drive initiatives on a strategic roadmap. Benchmark – Each quarter, we reassess where you’re at on your analytics journey and celebrate wins! Strategic Roadmap – Beyond the measurement of where you are at, we’ll turn this insight into action that is tailored to the specific needs of your business. A clear path is provided to achieve goals and desired business outcomes. Action – Our quarterly action plans are prioritized to address critical success factors to ensure you meet your goals and can adapt as necessary along the way. You’ll be able to more thoughtfully prioritize analytics and optimization initiatives. Ready to discuss your needs? If you have questions or you’re ready to get more actionable insight out of your analytics, Request More Information or call Toll-Free 1(888) 252-7866.